Knights Quest is a refreshingly different slot game, in more ways than one. For a start, the music and sound effects aren’t all those annoying, familiar sounds! What’s more, the background, symbols and the bonus games are all unique and have had a lot of thought put into them which makes a real difference! Everything about this slot games comes together to make you feel as though you’ve gone into the past, back to a time where people still lived in castles; fought with swords and went on quests! 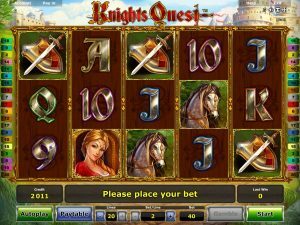 Fans of Kingdom of Legends, King’s Jester and Cindereela are sure to love this historical, fantasy-themed slot game. Unlike in the Middle Ages where the rich became richer and the poor became poorer, there are so many ways to win in this 5-reel, 20-payline slot that, just by playing, even the poorest of paupers can win enough to live like a King! There are so many medieval-themed symbols, such as: the horse, the sword and shield, the prince, the princess and the jester, and the aim of the game is to spin three or more matching symbols in order to get a payout. To see how much each combination will pay out according to your current bet, you can check the paytable. You’ll also be able to change your bet by using the plus and minus symbols to alter the number of lines you’re betting on, as well as the amount you wish to bet on each line. Similar to most other NovomaticCasino.co.uk games, you can play for fun until the time you feel you’re ready to deposit and go on a quest to win real money! Once you’ve got to grips with the game and you feel happy with your bet, you can put the game into ‘autoplay’ mode and watch as the reels spin themselves. Another classic feature is the game’s gamble feature, where you can have the chance you double (or more!) each win you get! All you have to do is click ‘gamble’ and choose correctly between red and back for the colour of the next card. If you’re right, you can try to double again, or collect, but if you’re wrong, you’ll have your win taken away! Knight’s Quest gives players the opportunity to win not one, not two, not three, but four different bonuses! The first is from the dragon himself! When you spin three or more dragon symbols, you’ll trigger the ‘Pick & Win’ bonus where you’ll need to choose one of the dragons, which have landed on your reels, and once you do, an amount will be revealed and given to you! The remaining dragons will also then reveal their hidden amounts so you can see whether or not you picked the highest-paying dragon. The other three bonuses will be offered to you after you spin three Scatter symbols (the bonus scroll). When this happens, you’ll be able to choose between the ‘Knight’s Quest’ bonus, the ‘Juggling Jester’ bonus or 15 free spins! If you choose to take 15 free spins, you’ll be able to play these with added stacked Wild symbols on the reels! If you choose the ‘Juggling Jester’ bonus, a Jester will appear with several multiplier balls! He’ll keep juggling until only one is left, and your win will be given to you multiplied by the number on that winning juggling ball! Lastly, if you choose the ‘Knight’s Quest’ bonus, you’ll join the Knight himself on a quest to enter the castle, where a whopping x250 multiplier awaits! Spin the wheel to move along the path, and land on ever increasing numbers, until you either make it to the castle or the arrow lands on a ‘collect’ segment of the wheel. Your original win will be multiplied by whichever number you end on and paid to you!